Memories of the pre-Christmas snowstorm that paralyzed travel across megalopolis in mid December might not be as fresh as the severe cold snap that kicked off the new year east of the Rockies. But the storm, which dumped 1-2 feet of snow on the Mid-Atlantic, earned a Category 3 ranking on the Northeast Snowstorm Impact Scale, known as NESIS, classifying it as a “major” winter storm. 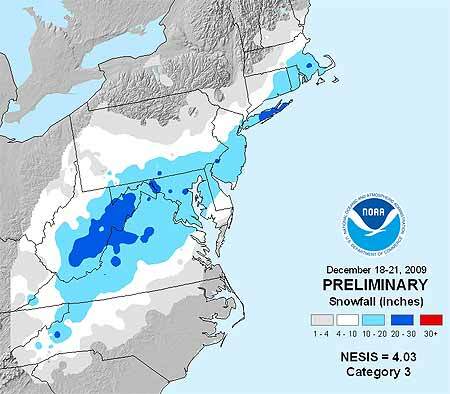 NOAA’s NESIS ranks Northeast snowstorms on a five-tier scale ranging from Category 1 “Notable” to Category 5 “Extreme.” It characterizes the storms based on how much snow falls (must deposit at least 10 inches); the size of the area affected, and the population of the impacted area. Developed in 2004 by renowned winter weather experts Louis Uccelini and Paul Kocin, both with the National Centers for Environmental Prediction, catalogs snowstorms dating back to 1888. “Last month’s storm was one of only five in the past decade that ranked Category 3 or higher,” says Kocin. The others: December, 2002 (Category 3); February, 2003 (Category 4); January, 2005 (Category 4); February, 2006 (Category 3), and February, 2007 (Category 3). Topping the NESIS scale—and the only winter storms rated Category 5—are the “Superstorm” on March, 1993 and the “Blizzard of ’96” in January, 1996. Last month’s snowstorm fell short of the higher NESIS rankings for several reasons, explains Uccelini. “While snowfall from the December storm ranked in the top ten for Washington, Baltimore and Philadelphia, the storm only provided a glancing blow to the New York City and Boston metropolitan areas and overall affected a relatively small area. This led to it being classified as a Category 3,” he says. Although NESIS is the only snowfall index being used operationally by NOAA, there are NESIS-like indices being developed for other parts of the nation. At the AMS Annual Meeting in Atlanta, a presentation by Michael F. Squires (Wednesday, 20 January, 2:00 PM, B211) will discuss the Development of regional snowfall indices. Addtionally, David Robinson of Rutgers University will introduce a new climate data record of satellite-derived snow cover extent in his presentation Northern Hemisphere snow cover extent during the satellite era (Wednesday, 20 January, 10:30 AM, B218).